Home > Car Care > When does a wheel bearing need to be replaced? The function of a wheel bearing is simple: to enable the wheel spin freely. There are two types of wheel bearings, tapered roller bearings and ball bearings. Tapered roller wheel bearings need to be periodically greased and adjusted. Ball bearings don't need any maintenance. How to tell which type of bearings you have in your car or truck? Tapered roller bearings are mostly used on non-drive axles. For example, many older rear-wheel drive pickup trucks have tapered roller bearing on the front wheels. One visual difference is that often there is a removable cap covering the adjustment nut in the tapered roller bearing setup. 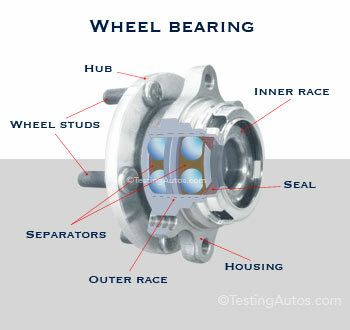 Today, the majority of cars SUVs and pickup trucks on the road have maintenance-free double row ball wheel bearings like the one in the image. 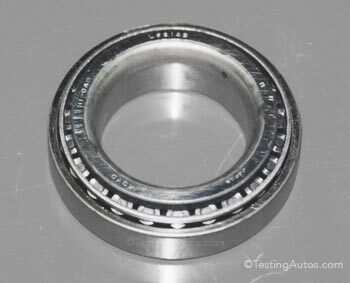 This type of wheel bearings often comes as an assembly with the hub. How long does a wheel bearing last? When does a wheel bearing need to be replaced? There is no mileage, or time requirements for the bearing replacement and in many cars wheel bearings can last a lifetime of the vehicle. A wheel bearing needs to be replaced only if it's damaged or worn out. What are the symptoms of a bad wheel bearing? The most common sign is when an internal damage causes a wheel bearing to produce a humming noise. This type of noise is more noticeable at higher speeds. The wheel bearing noise could get louder or quieter when the vehicle changes direction. For example, you might notice that it gets quieter or louder when exiting the highway. This happens when only one row of the wheel bearing gets damaged. The noise becomes louder when the load shifts to that side of the bearing during turns. 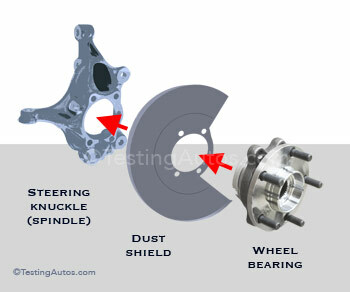 In many modern cars, the wheel bearing comes with the hub as an assembly. It bolts to the steering knuckle or spindle. Another symptom is when a wheel bearing becomes loose or has a play in it. Sometimes a loose wheel bearing can cause a squeaking or growling noise. Can a bad wheel bearing cause problems with the antilock braking system (ABS)? Yes, in may cars, a wheel bearing has a tone ring for the ABS sensor attached to it. If a wheel bearing is loose, the ABS sensor might not read properly causing the ABS warning light to come on. In some wheel bearings, the tone ring is built into one of the side seals of the bearing. If a wheel bearing is installed with the wrong side facing the sensor, the ABS system will also not work. What can cause a wheel bearing to go bad? Sometimes a wheel bearing deteriorates as a result of normal wear and tear. Moisture and corrosion can cause a wheel bearing to fail prematurely. A wheel bearing can also get damaged in an accident or when hitting a pothole or a curb. If you suspect a bad wheel bearing have your car checked. Tapered roller bearings like this one come in pairs, one larger bearing, one smaller bearing. A humming noise when driving can be caused by a number of problems, including a bad transmission bearing, unevenly worn or "cupped" tires and a worn-out differential. Since the wheel bearing noise travels through the chassis and metal panels of the vehicle, it's often difficult to pinpoint which wheel bearing is noisy. In most cases, a mechanic can determine if a wheel bearing is bad by listening for the noise with a mechanic's stethoscope and checking for looseness. Is it safe to drive with a bad wheel bearing? It depends on the condition of the bearing. Only your mechanic can determine this during an inspection. Is a wheel bearing covered by the warranty? Many manufacturers include the wheel bearings in the drive axle (e.g. front wheel bearings in a front-wheel drive vehicle) in the powertrain warranty coverage. Otherwise, wheel bearings are covered by the basic new car warranty. A bad wheel bearing might not be covered if it is damaged in an accident. This front double row ball wheel bearing must be pressed into the steering knuckle. Check the details in your warranty brochure. Is it OK to replace just one wheel bearing? Yes, if only one wheel bearing is bad, only that bearing needs to be replaced. There is no need to replace a good wheel bearing as a precaution. Can a wheel bearing be greased? Only tapered roller wheel bearings can be greased. 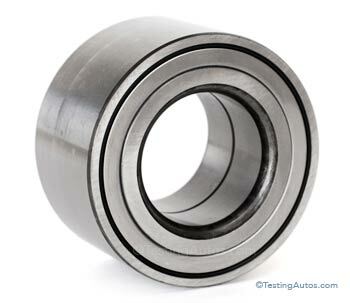 A double row ball bearing found in most cars is sealed for life and can only be replaced if bad. What is the average life of a wheel bearing? As we mentioned, in many cars wheel bearings can last the life time of a vehicle. In our experience, a vehicle might need one wheel bearing within 150,000 miles. To make the wheel bearings last longer, watch out for potholes and drive slower over speed bumps. How much does it cost to replace a wheel bearing?It depends on the labor involved. 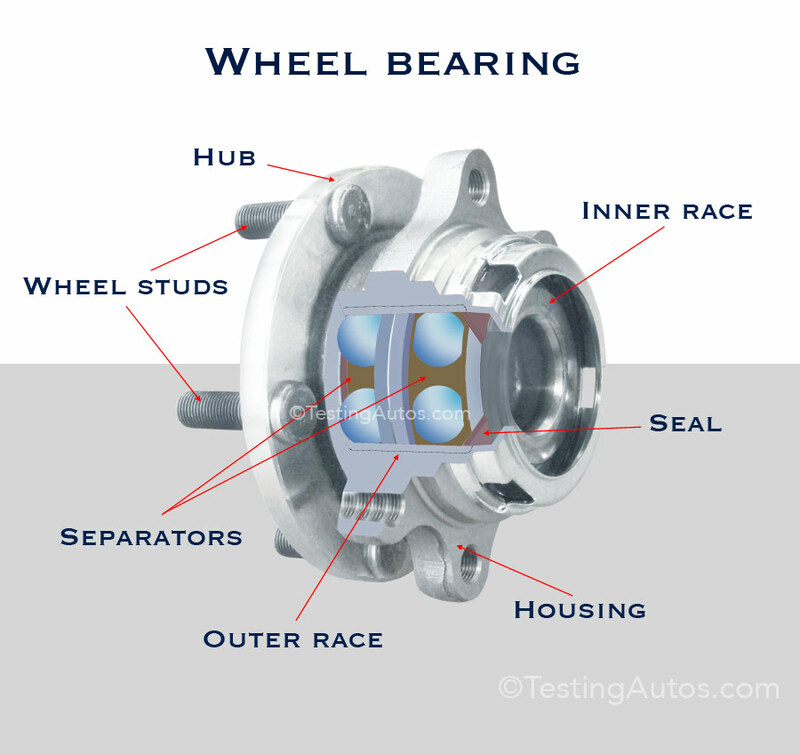 In many cars a wheel bearing comes together with a hub as an assembly. It bolts to the steering knuckle or spindle. In this case, it's easier to replace ($80-$180 labor plus $65-$180 part). In some cars a wheel bearing must be pressed into the steering knuckle or spindle with a press, which requires more labor ($120-$250 labor plus $40-$120 part). In some large SUVs and trucks, replacing a wheel bearing requires much more labor and is more expensive as a result. For example, replacing a rear wheel bearing in Toyota FJ Cruiser with a solid rear axle can cost up to $1,200 parts and labor. Tapered roller bearings come as a pair for one wheel and always replaced in pairs. The replacement of tapered roller bearings involves re-packing the hub with a new grease and adjusting the bearing pre-tension. Is it easy to replace a wheel bearing at home? Replacing a wheel bearing that comes as an assembly with the hub and bolts to the spindle or steering knuckle is not very difficult if you have proper skills, tools and the manual. Of course, the large axle nut is very tight and can be difficult to remove. If the bearing requires pressing in and out, it's best to leave it to the pros.